Are Your Kids Sad or Acting Out? Often a dog can make things better! Are you or your kids having a rough time? Going through a separation or divorce is never easy, especially on children. It’s a very emotional time, where the lows often overwhelm the highs. 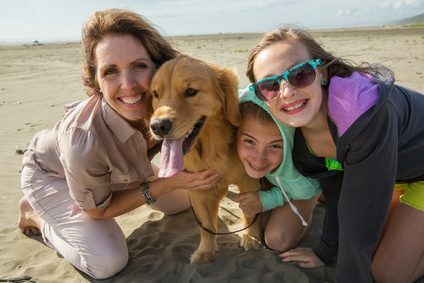 Sometimes a dog can help you and your children through this tough time. Research studies have shown that kids with dogs are less likely to suffer from anxiety. Kids can talk out their problems with their dogs without fear of rejection or criticism. Dogs don’t judge or criticize. They just wag their tails and show lots of love. Just holding or petting a dog provides emotional comfort. The emotional bond between children and dogs is very strong. The loyalty is fierce. Children going through a divorce can feel abandoned by one or even both parents. But they know their dog will always be with them. And having the love and companionship of a dog can make children feel more important and boost their self-images. Adults have similar bonds with their dogs. The dogs provide comfort, companionship, and relief from stress. When you are having a tough day, there is nothing like coming home to a dog that is excited to see you walk in the door, even if you have only been gone an hour. You, too, can get an emotional boost by owning a dog. So, if you are going through a separation or divorce, consider getting a dog to provide emotional support for you or your children. However, think it through first. Here are some factors to consider if you are thinking about getting a dog. Owning a dog is a major commitment. They are going to require time and attention for the next 10 or 15 years. You or your children could be allergic to pets. You will have to decide if you can live with the allergy symptoms before getting that dog. Your friends may also be allergic and stop visiting your home. Dogs can do damage to your belongings, especially if they are left alone for long periods of time. Dogs can be expensive. Their routine needs can cost at least $50 per month, more if the dog is large. When the dog is sick, vet bills can mount substantially. Do you live in a place that can accommodate a dog? You can’t expect a large dog to live in a tiny apartment, all alone for eight or ten hours a day. If you have children and a shared custody agreement with their other parent, you will have to decide what is done about the dog when the children stay with the other parent. Does the dog go with the children, and will the other parent want the dog? Or does the dog stay with you, and the children miss the dog until they come back to your home? Once you decide you want to get a dog, you will need to decide if you want a puppy from a breeder or a shelter or rescue dog. Dogs from breeders tend to be much more expensive than rescue dogs. If you visit a rescue shelter, there will be a wide variety of dogs to choose from, and the staff can help you decide on the right type of dog for you and your children, matching the temperament and personality of the dog to your family.